I am trying to buy some equipment for placing a camera and some lighting over my desktop. And having no physical shops in range and no friends or places to go and ask, all my "research" is via the Internet. And I'm finding it quite hard. The actual challenge is understanding how different parts fit together. 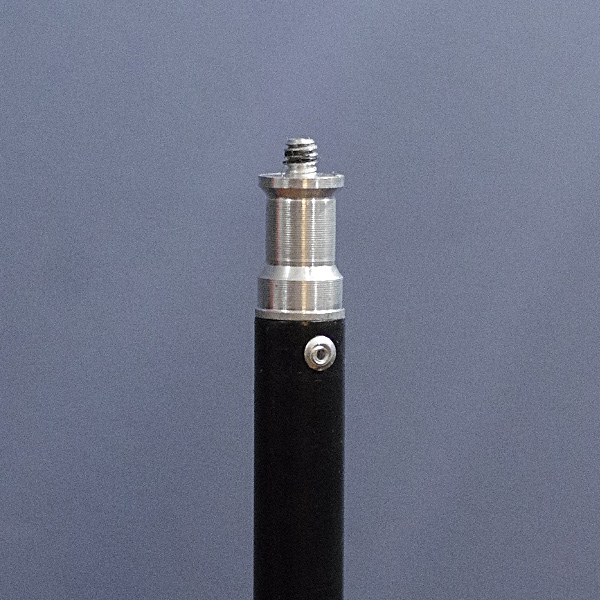 For instance, this telescope boom with a swivel joint from eBay (more pictures on eBay article). 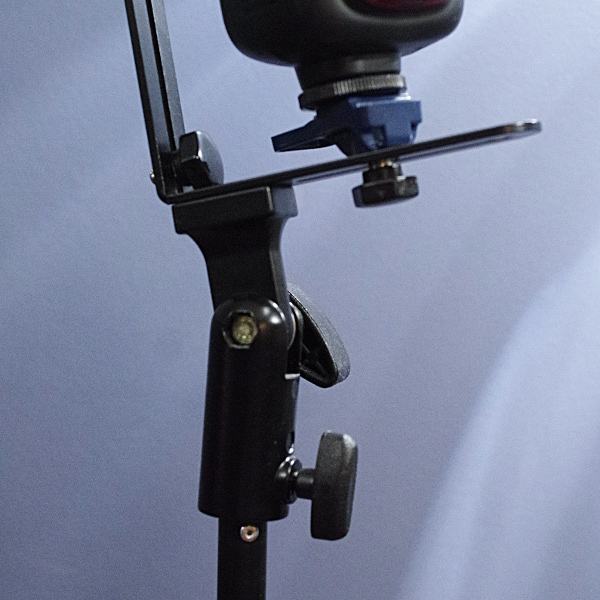 The article states: "Easily mounted on any standard light stand". 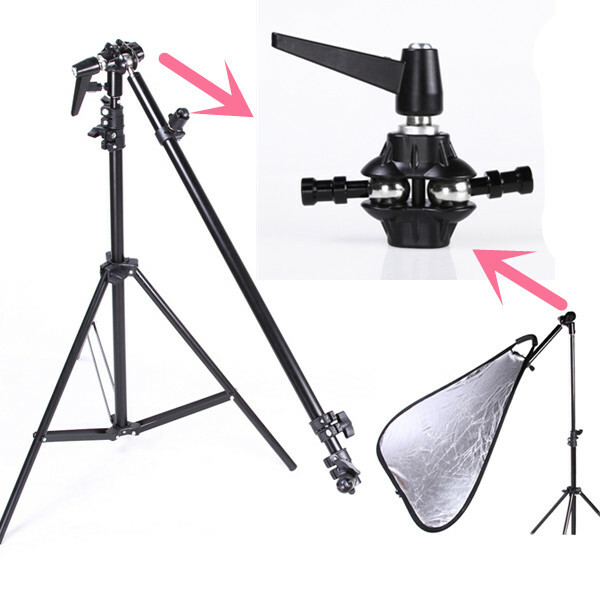 What is a standard light stand? I would like it to be mounted on a clamp on the shelf above my desktop. But what should such a clamp look like? Does such a connector have a name, that I can search for? 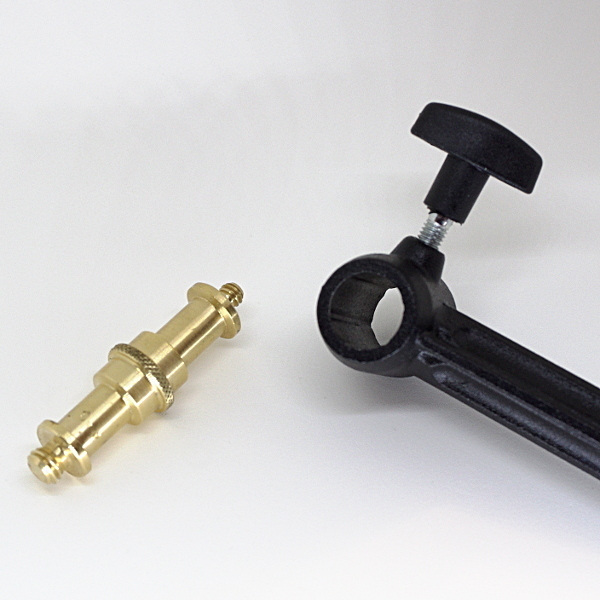 There are two basic connectors you will generally find on light stands. First, a 3/8-16 UNC thread (that's 3/8", 16 threads per inch). This is, fortunately, basically standardized in all such gear. Second, a 5/8" stud, usually meant for clamping things to, or often attaching things via a socket with a screw on the side. This socket is often called a "receiver" or "receptor" — useful to know if you're searching. Although it's not in the zoomed-in detail image of the example you posted, you can see from the in-context graphic that it's the stud that is in use in your example. The last image shows it most clearly — on the left side there is a big handle for the hinge; ignore that but look at the smaller thumb screw on the central part next to it. That wider black tube is the socket, and the screw tightens to hold it to the stud. You can see that the socket just slips down over the stud and the side screw holds it in place. Additionally, you can (relatively easily) find adaptors meant to attach a screw to a stud or vice versa, and adapters from to go to or from the standard 1/4-20 thread used to attach cameras to tripods. Here, the stud slips into the ring and is held tight, and one can attach either a camera with the 1/4-20 side, or other lighting equipment — or, a tripod head, as these typically attach with the same 3/8-16 thread. 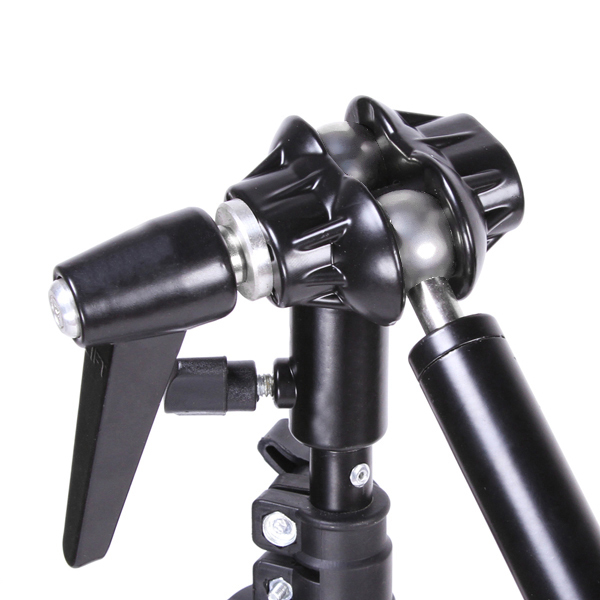 Or of course you could attach that arm to something else with a similar stud — directly to a light stand, for example. If, sometime in the future, you end up with a weird special need, check the Studs, Receptors & Pins section at B&H (or ask at your favorite local camera store, if you are lucky enough to have a good one). All sorts of pins, hooks, plates, and so on, all with the same basic system. Not the answer you're looking for? Browse other questions tagged studio-lighting or ask your own question. Why is a 1" sensor actually 13.2 × 8.8mm? What are some precautions to consider when using HMIs? How do you light the background for chroma key work? What is “feathering” a light? What are the difference between using a pack and head system versus monolights? What is the impact of light-tent size? What's the technical difference between artificial and natural light? What is the prop setting on studio flashes?